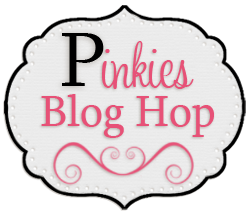 Welcome back and thank you for stopping by today for Part 2 of the Pinkies Spring/Summer Blog Hop. 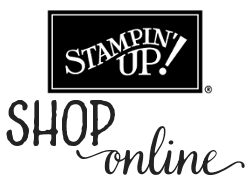 We are showcasing lots of new gorgeous projects today, using products from the new Stampin’ Up!® Spring/Summer Catalogue. Simply use the buttons at the end of each post to keep on hopping. We love comments, so please tell us what you think! 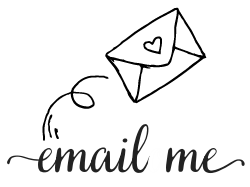 I should also welcome you to my brand new blog. I had got a bit fed up with the mistakes I had made so decided to make a clean start. It has taken a while – I’m too much of a perfectionist! 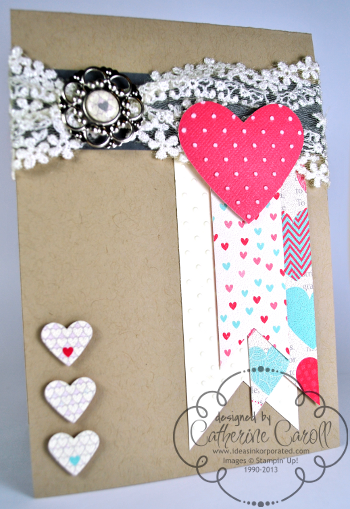 I have kept previous blog hop posts, and photos of old projects will make their way into my gallery page. It’s not perfect yet, but I’m working on it. What do you think? 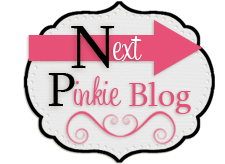 Anyway… if you are working through part 2 of our blog hop weekend, you should have joined me from Christa’s blog. 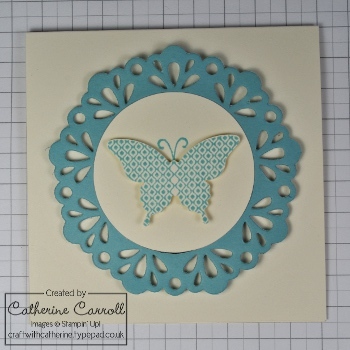 I have to admit, I wasn’t sure about the Rain or Shine stamp set in the cataloge (too much fussy cutting needed! ), but I think she now has me convinced. I decided to use the More Amore designer papers and the Artisan Embellishment kit from our lovely new Spring Summer Seasonal catalogue. Now, with such beautiful papers and accessories, I really had to try hard to actually *cut* them, rather than just admire them. I hope that what I have created does them justice. 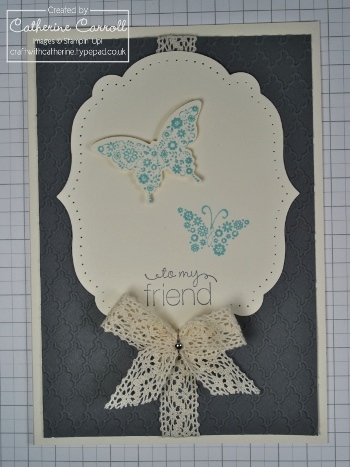 Combining the Primrose Petals Core’dinations with Perfect Polka Dots embossing folder allows you to add a subtle extra texture to any project. 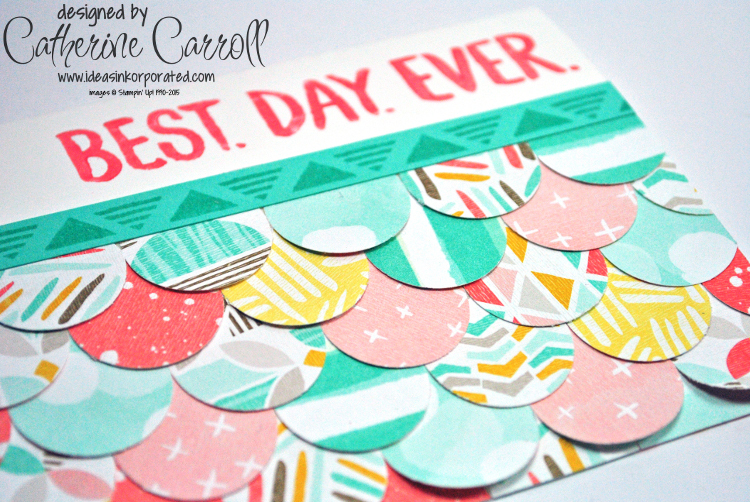 I panicked first of all when I saw that I’d have to cut a circle of paper for the Designer Builder brad – I should have known that Stampin’ Up! would have thought of that and matched it to a punch! Luckily the Itty Bitty punch pack had made it in to one of my orders long ago. I also wanted to try a treat pouch of some sort. 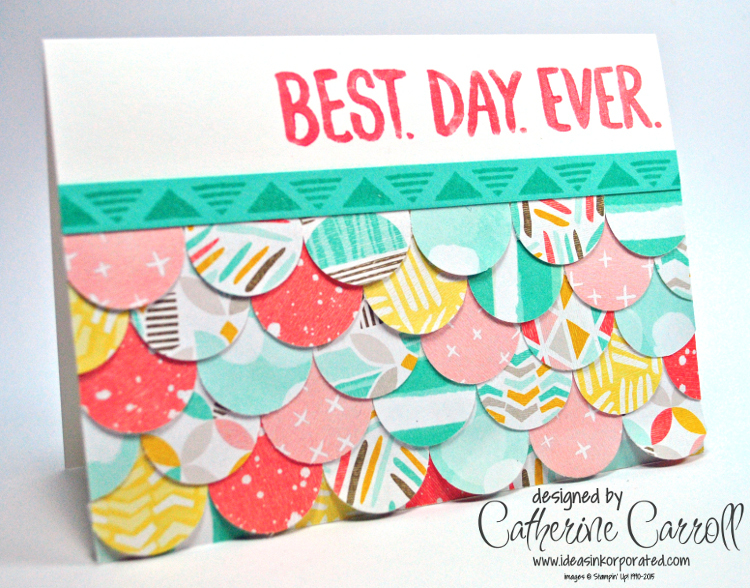 The next stop on our blog hop is Michelle Last. If you’ve finished part 2 of our hop today, do have a look at yesterday’s posts if you haven’t already. There are so many beautiful projects that I know will inspire you. 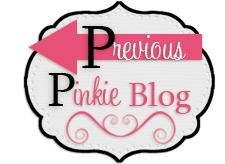 Part 1 of the blog hop starts here.